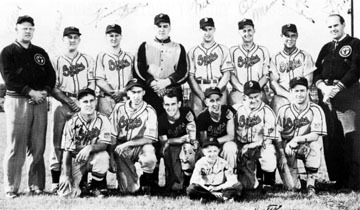 THE 1945 GIPPS BREWERY FAST PITCH SOFTBALL TEAM, the ninth managed by the late Harold "Red" Koeppel and the second to play a major schedule, was one of the strongest teams ever formed during a time when the sport was huge in the Greater Peoria area. The 1945 Brewers posted a 42-6 record, four of the losses coming against the famed Ft. Wayne Zollner Pistons and the other two in the Midwest Regional tournament. Never losing to an Illinois team, Gipps also defeated the Kentucky, Milwaukee, Indianapolis and St. Louis champions. They won the Peoria District, the Central Illinois District, the Illinois State, were third in the Central States regional, first in the Greater Peoria league and first in the Greater Peoria tournament. Playing in the Midwest regional in Indianapolis, the Brewers won a 26-inning game against Louisville, at the time an Amateur Softball Association record. Veteran fastballer Bill Perry led the team with a 40-4 record; Roddy Thompson and Bill Manuel each hit .351 to lead the team, Ray Fisher scored 39 times and stole 17 bases and veteran catcher Bill Porter caught almost every inning. The Brewers were strictly a local team with every member veteran Peoria players who attended school here. The team eventually founded the Independent Sports Club that has helped thousands of young girls and boys enjoy sports.